Like many of us, I have always been fascinated by Beatle legend John Lennon. I love his music of course, but the way he lived, and his artistic expression has always grabbed my attention and heart. Now his artwork, part of a series called “Bag One” goes on display this weekend here in Los Angeles. 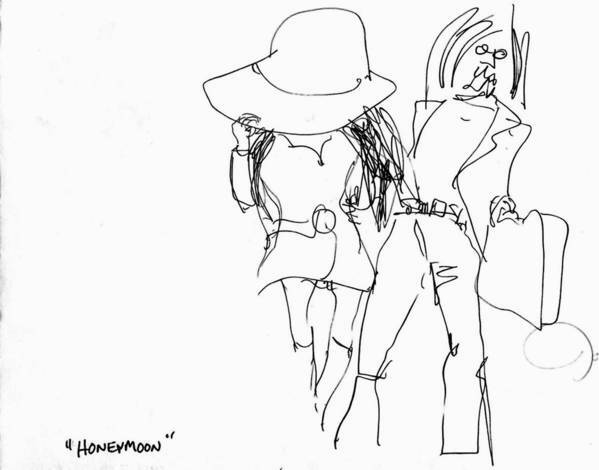 I wish I could own the lithograph called “Honeymoon.” It’s neat to think of the moment in time he and Yoko Ono experienced with one another. She is now 80 years old, and has set up a business called Bag One Arts in an attempt to keep her late husband’s legacy as an artist alive. Two of my favorite quotes by J.L. Today I was back at the South LA Shelter for a meeting with some of the staff there. Four of my Lu Parker Project volunteers and I met with a staff member to discuss how we can continue to help the shelter through a project we do called Project Picture. This was the first time we have had an official meeting since the SLA shelter moved to its new location, and I have to say it felt great to be at the new facility! As we all know, change is sometimes difficult, and I have to admit at first I sort of missed the old South LA shelter, a place where my passion to help animals was flamed some four years ago. I spent countless hours in the old space either alone in the early years, or then together with my LPP volunteers as time passed. It was my little getaway. It was my second home for a long time. I still miss it and all its cracks and dust. Today while sitting in our little meeting, a wave of “this feels good” came over me. It’s that feeling I had 3 years ago when something told me “Lu, you should start a non-profit.” During those moments you just know you are doing what you were born to do. As small as our actions may seem at times to ourselves and others, I could not help but burst with pride today when I looked over during the meeting, and caught the eye of one of my faithful volunteers. The joy in her eyes as she smiled back at me made me not just think, but know that I am where I am suppose to be now again, and I have an amazing team joining me for the journey.